In May 2014, Officer Jack Trabucco was inducted into the Natick High Sports Hall of Fame, honored for his outstanding achievement as a high school athlete in Natick, Mass. Trabucco has served on the Wellesley campus police force for 28 years. Natick is adjacent to the town of Wellesley, and Trabucco had served on the Natick police force for four years. “Coming to Wellesley was the best decision I ever made,” he says. 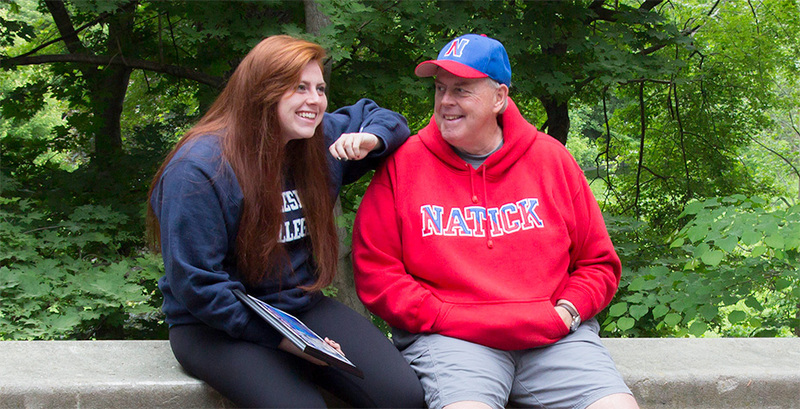 His daughter, Kelsey Trabucco ’16, might be able to say the same thing. A high school softball standout herself, Kelsey imagined she would continue to play in college. Until she got the crew bug. She is part of the Wellesley rowing team that finished fourth in the team points trophy at NCAA Nationals in May. Jack Trabucco graduated from Natick High School in 1973, where he was all-scholastic in football (wide receiver) and baseball (center fielder), and made it a three-sport career with basketball (power forward). Wicked Local Natick reported that, among other things, he caught 15 touchdown passes in 18 games during his junior and senior seasons, and scored the spectacular winning touchdown in the 1972 Thanksgiving game. He went on to play four years of baseball at Northeastern University. Now he sticks to the lifelong sports of golf and bowling, and a very active profession. “I’ve reaped the benefits of sports ever since those early years,” he says. “Everything in my life has derived from that. It’s really helped my career,” he adds, noting that being a cop is a lot like doing a team sport. On a day like Commencement, for example, when 6,000 people are on campus, the whole force has to coordinate to take care of the routine and the unexpected calls for help and direction. And in any situation you have to be comfortable relying on and supporting your colleagues when an assist is needed. Trabucco praises Chief of Police Lisa Barbin for creating a culture on the force that promotes that kind of approach, with democratic decision making at its heart and dedicated time for training.